Since we started receiving our weekly box of organic and locally grown produce, I have come to adore this time of year. And that is saying a lot. At this point in the year, I am mentally and physically done with summer. The desert heat is trying my patience, it is draining my energy and any twinge of adoration I might feel for this season is attributed to only one thing: food, of course. I may not feel it in the air just yet, but I can see the beginnings of that blessed seasonal transition in the contents of our weekly produce box. Heirloom tomatoes, Asian pears and fresh figs. I absolutely love fresh figs and their appearance in my box is a reassuring sign that yes, autumn will eventually bless us with its presence. And yet, the bounty of beautiful fresh figs in my kitchen provokes that all too familiar question: what to do with this? The past two weeks have yielded what, in our busy household of two, is considered an over abundance of fresh figs. I absolutely adore them right out of the basket. But a girl can only consume so may figs in a day. So, naturally, I set out to find some new recipes and impromptu dishes made with these delicious end-of-summer delights. The first thing that came to mind was a smoothie. 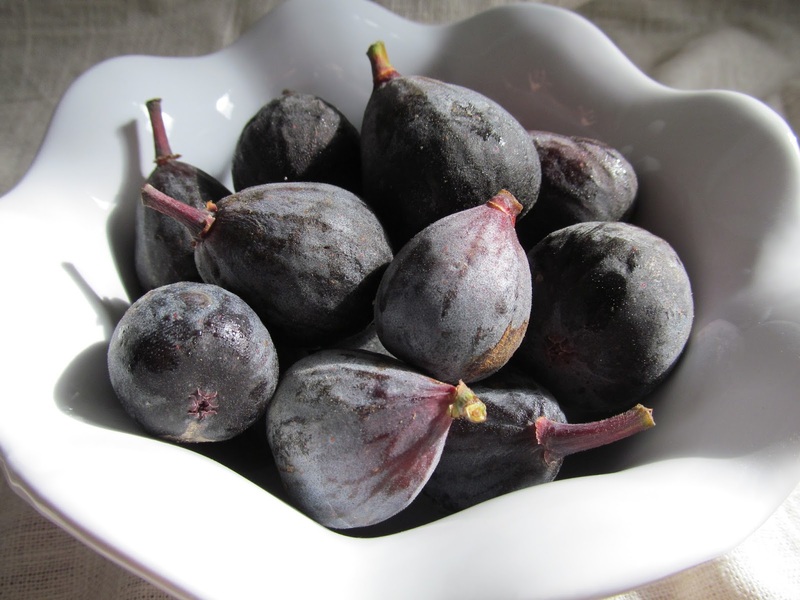 I love figs because they are fruity and sweet, yet not too sugary. 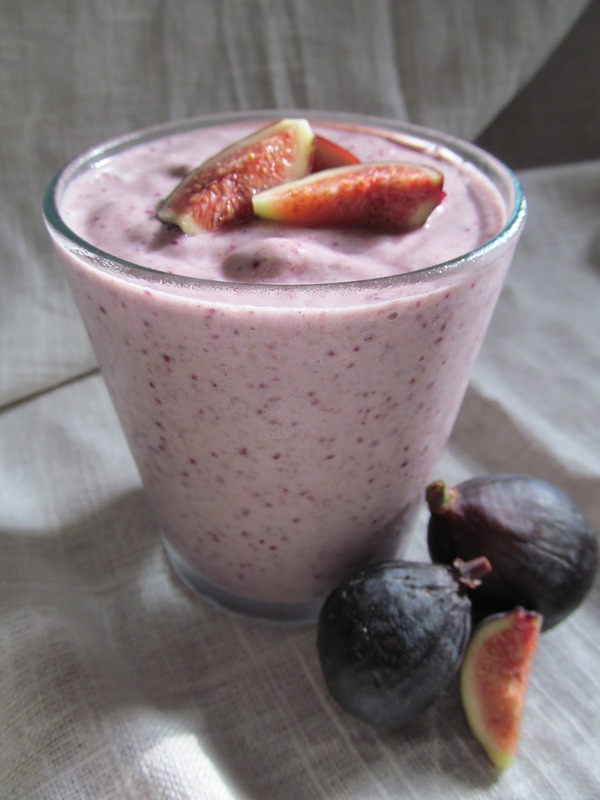 I found this recipe for a creamy fig smoothie and it looked so delicious I just had to try it. And I’m so glad I did, for I have discovered a new favorite smoothie! Something to look forward to in this dreaded period of awaiting the changing of seasons. 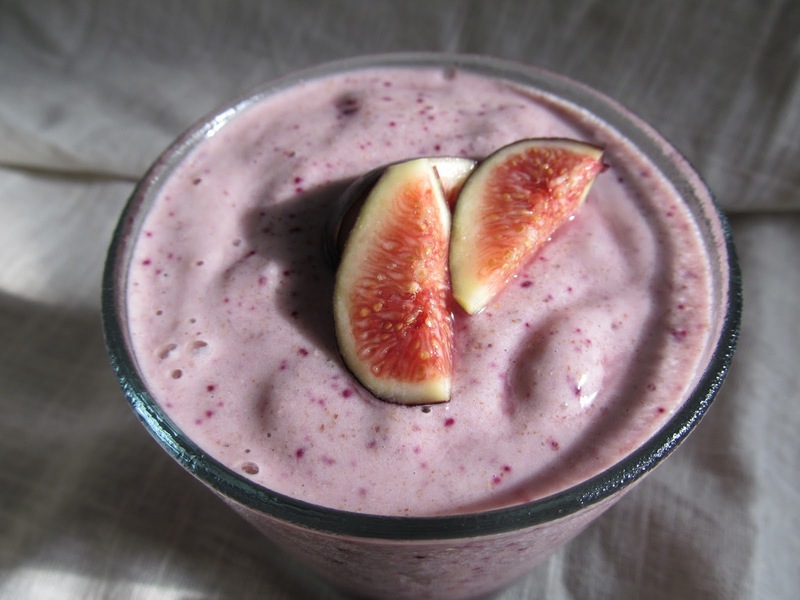 It is creamy, dreamy, healthy, sustaining and oh so pretty. I modified the original recipe to fit my personal tastes and pantry supplies and it was perfect. I was more than delighted when, in the early a.m. hours, running late, I realized I had stashed a jar in the freezer to quickly grab on my not-so-punctual way out the door. And this smoothie (mostly thawed) hit the spot when the mid-morning munchies struck. Hmmm…what now? You can’t go wrong with sliced fresh figs atop a toasted homemade bagel smothered in cashew cream cheese and drizzled in honey. 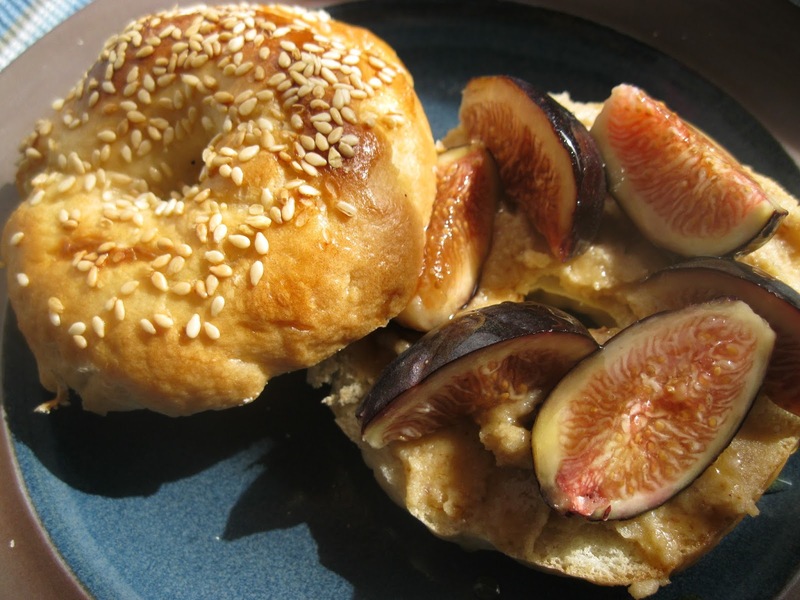 A dear friend of mine thoughtfully gifted me her homemade bagels which, when topped with organic figgy goodies, made for one of those rare and precious Sunday solace moments. 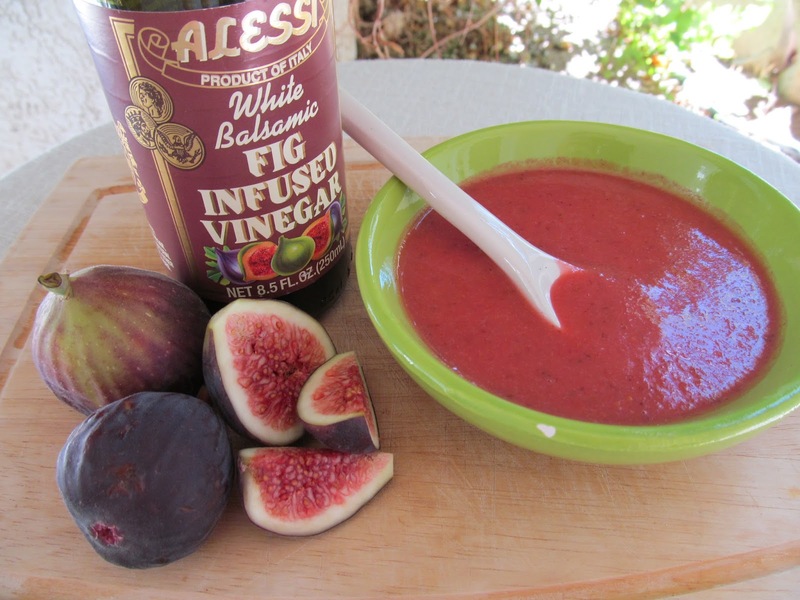 Now, thinking of dinner and something new for my lunchbox, I envisioned salad dressing…vinaigrette, perhaps, made with my pretty pink summer figs. In a serendipitous moment, I discovered a recently purchased bottle of fig-infused white balsamic vinegar stashed away and forgotten in the cupboard. Well then, Fig Balsamic Vinaigrette, it is. This dressing was one of those “I didn’t use a recipe” sort of things. I used a blender and tossed together a few organic black mission figs (5 or 6), maybe 1/4 cup or more of fig-infused white balsamic vinegar, a tablespoon of dijon mustard, some olive oil, a tablespoon of lemon juice and salt and pepper to taste. I blended everything together and made a few adjustments until it tasted yummy to me. Nearing summer’s end, the refrigerator is still loaded with organic stone fruits searching for a purpose. 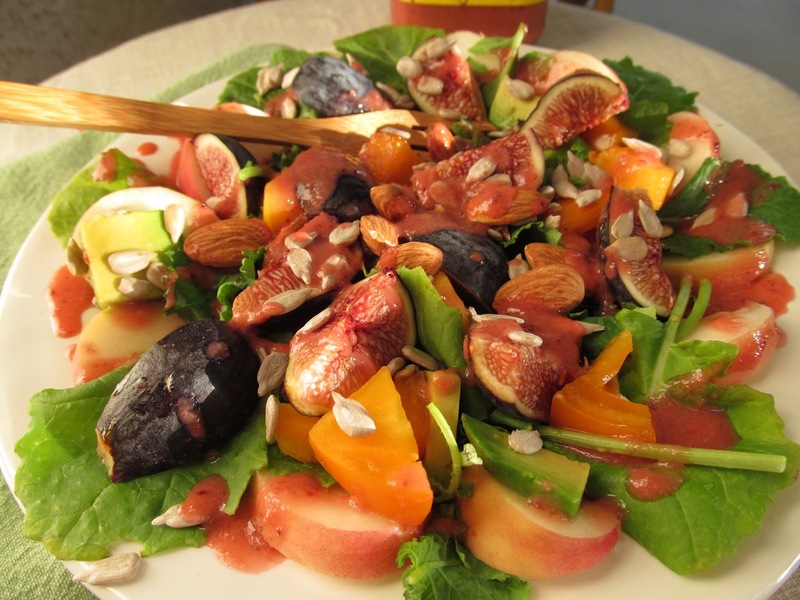 That was my inspiration for this kale salad loaded with white cling peaches, avocado, figs, tomato, sunflower seeds and almonds. 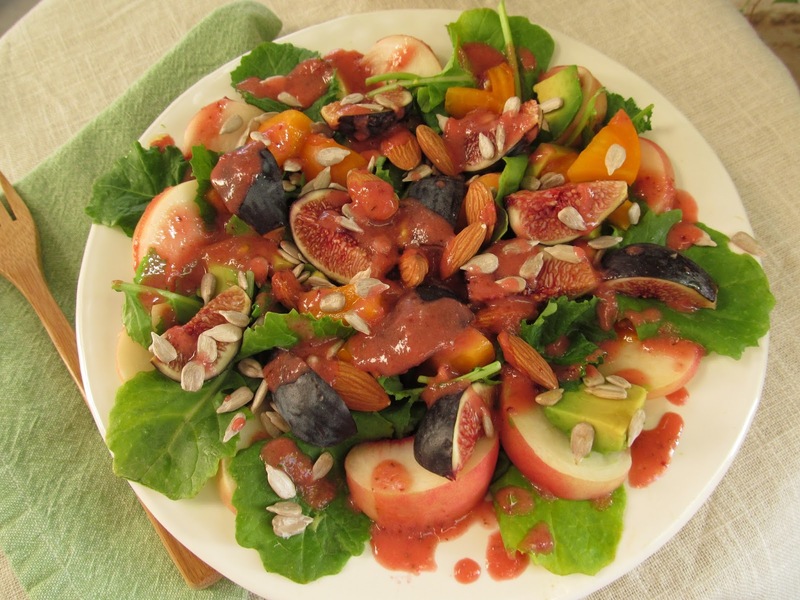 Packed with protein and drizzled with this fruity vinaigrette, it was light and sweet, yet substantial enough call itself a meal. 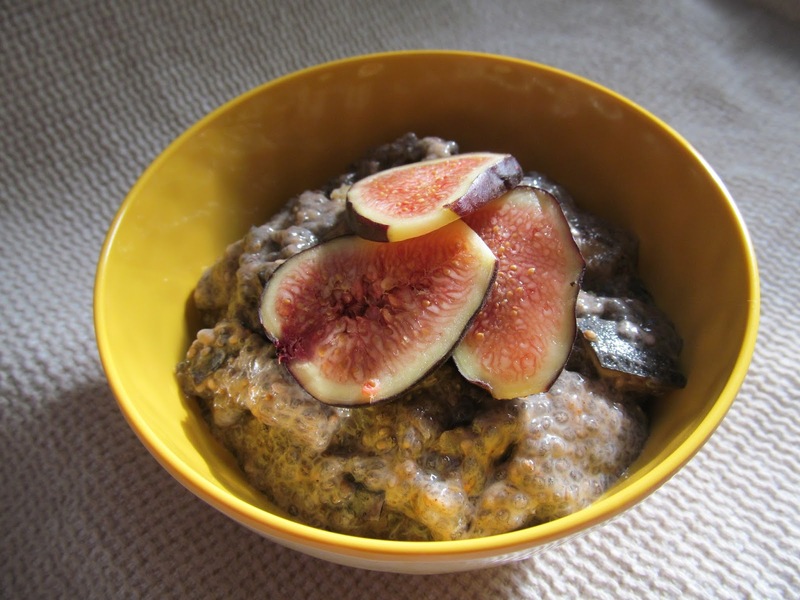 It seemed only natural to incorporate figs into my favorite superfood dessert, chia pudding. Well, I like it for dessert, but some prefer it for breakfast (in which case, we would call it chia cereal). I made myself a serving of my favorite and very simple chia pudding, but I tried adding a little dash of fall flavor hoping it would compliment the figs. Delicious! 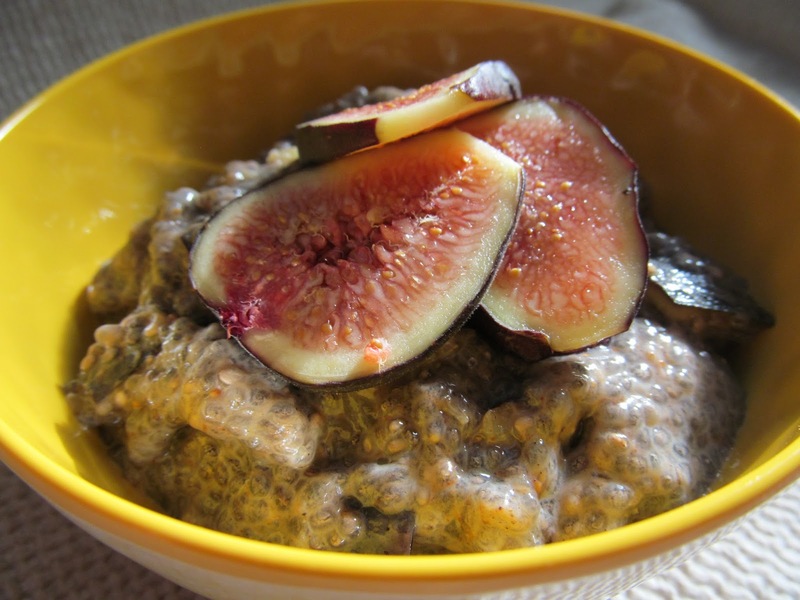 With a few fresh figs, a little cinnamon and just a bit of cardamom, my chia pudding suddenly took on a whole new seasonal feel. For this chia pudding simply mix together the following ingredients and allow them to gel in the fridge for 20 to 30 minutes. Another fun seasonal produce adventure, another week done. Friday is here and I’m definitely feeling figgy. Our weekly bounty of fresh fruit has found a purpose, satisfying our taste buds and our bellies. And I can make peace with the heat for a little longer, knowing another season is just around the corner. I do enjoy my explorations in food. How about you?